Congratulations, you are now in the first week of your third trimester and on the home stretch. By week 27 of pregnancy your uterus will have risen and is close to your rib cage, this can prevent your lungs from being able to expand completely, causing a shortness of breath. Your expanding uterus also puts extra demand on your circulatory system which may mean you have less energy than in previous weeks. If feeling fatigue then you may like to take breaks during the day or even have a nap. At this stage of your pregnancy you may be experiencing a slightly embarrassing problem known as stress incontinence. A mixture of pregnancy hormones and a baby resting on your bladder can cause slight bladder leakage. A laugh, sneeze, cough and even exercise can cause a small amount of urine to leak. It can be a very frustrating problem, especially when out in a public place, however you can help to prevent stress incontinence by strengthening your pelvic floor muscles. Not only should this help with the leakage but will help during the delivery of your baby. There are simple exercises to increase the strength of your pelvic floor that you don’t need to go to a gym to do and can even do while sitting on the couch. In fact these exercises can be done discreetly at any time, anywhere. Simply practice contracting and releasing the muscles in your pelvis (the same motion as if you were to stop the flow of urine when using the bathroom). Squeeze the muscles for 8 to 10 seconds, then release, continuing for up to 50 repetitions during the day. 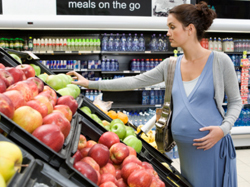 From now on you will need an extra 300 to 350 calories each day to sustain your baby during pregnancy. Your body will continue to grow and put on weight up until about the 36th week of pregnancy. Continue to eat a healthy, well-balanced diet and don’t let your weight gain worry you. It is perfectly normal to put on weight during pregnancy, if you are overly concerned about your weight gain speak to your doctor. You should never diet when pregnant however remember it is safe to maintain some regular exercise. For further information on exercise during pregnancy and how to maintain a safe exercise regime when pregnant, check out the article Exercise Information in the “Pregnancy Baby Child” Pregnancy Guide. The next three months of pregnancy can be a very trying time, with extra pressure put on your body due to your expanding size. You can unfortunately suffer from all sorts of problems in the final months such as leg cramps, varicose veins and hemorrhoids. Remember that at this stage of pregnancy you may begin to experience braxton hicks contractions, these contractions help prepare your body for labour. They are quite random, can feel uncomfortable but should not cause you serious pain. If you are experiencing braxton hicks regularly or they are painful seek medical advice as it can be a sign of pre-mature labour. You should know the signs of pre-mature labour as you enter your third trimester and be prepared for labour at any time! Incredibly at this stage of the pregnancy your baby’s heartbeat may be loud and strong enough to hear if daddy puts his ear up to your tummy. The baby continues to grow and is approximately 37 cms from crown to feet, weighing about 875 grams. Another interesting fact at this stage of pregnancy is some specialists believe your baby will start to dream! 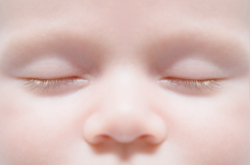 No one actually knows what they dream about but this part of the baby’s brain is active at 28 weeks of pregnancy. It certainly is an interesting point to ponder and consider all the wonderful things going on in your baby’s mind as they sleep inside of you. He/she can now open their eyelids and has the retina develops will notice light and transmit these messages to the brain. As your baby develops, the brain will process and receive light from images on the outside of your womb soon to recognise shapes and sizes. However his/her vision won’t stabalise until a few weeks after birth. Have you been feeling some strange, rhythmic movements from inside you? These could quite possibly be your baby hiccuping! They usually don’t last long however they are quite common at this stage of pregnancy.